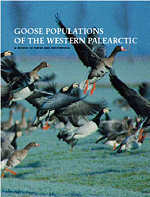 The book reviews the status, trends, distribution, ecology, conservation and management of 23 populations of geese breeding and wintering in the Western Palearctic. It synthesises monitoring data and research results compiled by the Goose Specialist Group of Wetlands International since the 1950s. Each population chapter contains a population review and a description of numbers, distribution and conservation management in each of the flyway range states. The texts are written by international teams of experts. The book is written as a source of reference for the international goose research and nature conservation and management community as well as for a wider audience interested in geese. The international goose database is managed by Wetlands International and Alterra (toon.helmink@wur.nl). This database contains goose censuses out of Europe and the Middle East, and is used to estimate current population levels to establish the level of Ramsar criteria. National information is only available from national coordinators.